JESUS lives many lives in the Blessed Sacrament. In one sense He may be said to lead many exterior lives. For in each tabernacle where He is reserved, He meets with different treatment, performs different miracles of grace, receives different petitions of want and sorrow, abides a different length of time, and is the object of different degrees of love. There is in this sense what may be called an outward biography to every consecrated Host. But this is not what is meant by saying that Jesus lives many lives in the Blessed Sacrament. What is meant is interior, mystical, and of a spiritual character. His life in the Blessed Sacrament is different from the life He leads in heaven; it is under different conditions, and follows peculiar laws, according as He has willed it. His life is a state of mystical death. It is a life in which He foregoes the use of His human senses. In the adorable Host He does not see with His man's eyes, nor hear with His man's ears. He restrains all these things, and hushes Himself into a mystical death in order that we may be the more fearless, though not the less reverent, in handling Him; the more familiar, though not the less humble, in approaching His mysterious Presence. But besides this, there are senses in which He leads in the Blessed Sacrament an active life and a contemplative life, a life of poverty and a life of divine riches, a life of suffering yet also a life of glory. As many states as there are in the spiritual life of the faithful, so many lives are there which He leads in the Blessed Sacrament. The apostolic missionary, the cloistered nun, the lonely hermit, the busy merchant, the prelate and the child, the fresh penitent and the experienced contemplative, behold Him in the manifold depths of His sweet Sacrament leading their lives, and winning them to Himself by a sympathy of state and occupations, so marked and decided as seemingly to exclude any others. While He is the pattern of all states, He seems to be the exclusive representative of none, just as His whole Passion was all for each one of us, while it was also all the while for the whole world. But we shall have occasion to return another time to these various lives in the Blessed Sacrament. We have now to examine the peculiar spirit which devotion to these lives of Jesus gives out and impresses upon our souls. The Blessed Sacrament was markedly instituted in commemoration of our Lord's Passion. The time and the circumstances of its first institution leave no doubt whatever upon the subject, even independently of the positive precept of commemorating the Passion thereby. The Mass is itself externally a sort of drama of the Passion, and internally it is the identical Sacrifice perpetually and bloodlessly renewed. Yet, on the most superficial consideration of the matter, we cannot avoid being struck by the obvious analogies between the Blessed Sacrament and the Sacred Infancy; and when we come to examine it fully, we arrive at the conclusion, that while the spirit of the Sacrifice is the spirit of Calvary, the spirit of the Sacrament is the spirit of Bethlehem; and the whole character of the devotion resembles, as closely as two devotions can resemble each other, the Devotion to the Sacred Infancy. Let us now proceed first to establish the fact, next to discover reasons for it, and then to draw out the analogy at length. We naturally look first to the language and practice of the Church. In the hymns and office for the octave of Corpus Christi we are continually being reminded of the Childhood of Jesus, in such a way as to show that the two mysteries were united in the mind of the composer. There is no proper Preface allotted to the masses of the Blessed Sacrament, but the Preface of the Nativity is borrowed, as if it were equally applicable to both. Passing from the conduct of the Church to the interior life of her children, we find the two devotions to the Blessed Sacrament and the Holy Infancy constantly united, and connected as it were naturally together. With certain differences the one seems to produce the same spiritual fruits as the other, to suggest corresponding devout exercises, and to lead to the same ascetical practices. Sister Margaret of the Blessed Sacrament, a Carmelitess of Beaune, whom God raised up to give such an impulse and fresh extension to the devotion to the Sacred Infancy, is a case in point. Her whole life illustrates the connection which we are now considering. Indeed our Lord Himself seems to point to it by the manner in which He vouchsafes to appear to His saints and servants in the Blessed Sacrament. No one can be conversant with the lives of the Saints without being struck, not only by the similarity of nearly all these apparitions one with another, but also by their being almost uniformly apparitions of Him as an infant, with or without His Mother, and most commonly without her. There are instances of His appearing in the Host as He was after the Scourging, another time as crowned with thorns, another as carrying His Cross, and another as risen. But these are quite the exceptions, and very rare ones. In almost every instance, when He vouchsafes to cheer or to instruct His saints by these visions, He appears as the Babe of Bethlehem, sometimes struggling as if in pain, and reluctant to be given to some one in Holy Communion, and sometimes imparting benediction to the assembled people. In that vast and various system of private revelations which our Lord condescends to make of Himself, His ways, and wishes, in the hidden wonders, the visions, dreams, locutions and ecstasies of the Saints, there is no fact more undeniable than this, nor more striking, from the frequency of its occurrence and the uniformity of its manifestations; and it clearly shows that the connection between the Blessed Sacrament and the Sacred Infancy is real and Divine. But if this remarkable phenomenon arrests our attention, we may venture also to search for the reasons of it. The very facts of the two mysteries present themselves to our minds at the outset. The one seems to foreshow the other. The Blessed Sacrament appears to reflect in its own peculiar way every detail, however minute, of the Sacred Infancy. 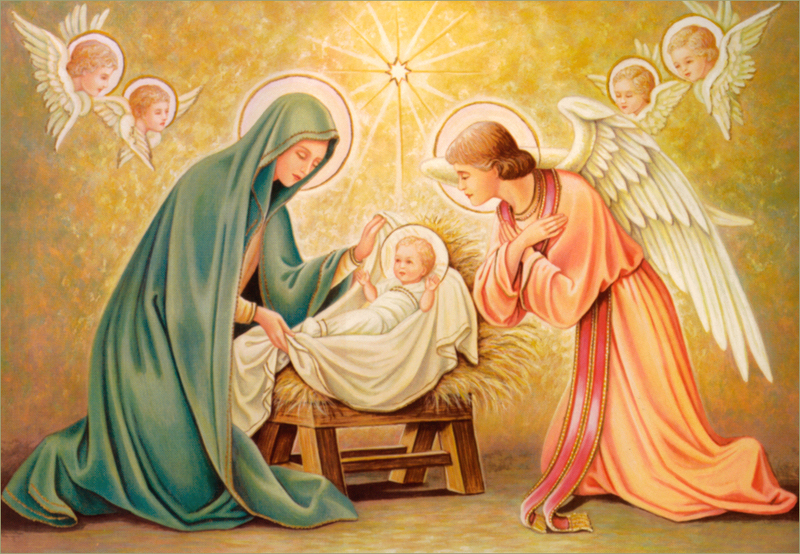 The Babe is born in Bethlehem, the "House of Bread," and born in a manger, as if to be the food of men, who through sin have become, in the Psalmist's words, as it were beasts in the sight of God. The altar and the manger are too full of parallels for anyone to need to have them drawn out. The swaddling clothes of Bethlehem are the accidents of the Host. The Consecration in the Mass answers to the mystery of His Birth; and the various offices and familiarities of His priests with His Body are but so many renewals of the manifold ministrations, which He submitted to receive at the hands of His foster-father, St. Joseph. So that if we meditate, first on one and then on the other of these mysteries, we find the same trains of thought arising in our minds and the same aspirations forming on our lips. The method of the Divine condescensions is the same in both cases. If we look at devotion to the Blessed Sacrament in a doctrinal point of view, we shall see why this is so. Although we cannot separate the Sacred Humanity from the Person of the Eternal Word, nor worship it apart from the Hypostatic Union, -----[the author had a note here about a former dispute by theologians, which is no longer germane, so we omitted it]----- it is nevertheless true that the worship of the Blessed Sacrament is peculiarly a worship and the highest worship, of the Sacred Humanity; because it is the Sacred Humanity which is prominently present in the Blessed Sacrament by the precise power of the words of consecration, while the Divinity is there, not by the force of consecration, but by concomitance, and so also is our Lord's Human Soul. Thus the Blessed Sacrament is in a special sense the Body and Blood of our dearest Lord. It is the Presence of His Sacred Humanity, and the peculiar theatre of its wonders. If we compare devotion to the Passion with devotion to the Sacred Humanity, we shall see how this bears upon our subject. In the Passion our thoughts are occupied, not so much with the fact that our Lord is God and that He is man also, as with the intensity of His sufferings, or the beauty of His patience, or the liberality of His love, or the dreadfulness of sin, or the terrible consequences of the Father's wrath, or the horror of Jewish malice and our own. What Jesus said, did, thought, endured, how He looked and felt, and why He went though all this,-----these are the subjects of our contemplation in the Passion; and the interest of them all is not only heightened immensely by the continued remembrance of His being God made man; but that remembrance is simply necessary to the contemplation altogether. This is the case, because it is not a romantic story which is moving our affections, but it is a mystery of Christian doctrine which is stirring the depths of our nature, overwhelming us with its majesty and heavenly pathos, and calling up all those complicated natural and supernatural feelings which form the Christian mind and sentiment. Still the remembrance of our Lord's Divinity is not the single or the overwhelming thought in the Passion. Now, in the Sacred Infancy our Lord's character, His doings and His sufferings, and His interior dispositions are far less prominent in our meditations. Indeed many persons hardly ever think of them at all. It is the grand fact of the Incarnation which is present to our minds, diversified it is true in countless ways, yet still the same one fact or mystery. Jesus sleeps, and we reflect with delighted wonder on the sleep of the Uncreated and Unsleeping, of the "Watcher of Israel Who neither slumbers nor sleeps." He sheds tears; and if our tears follow the sweet memory of His, it is because it is so touching to behold in the omnipotent God the evidences of true humanity, the most tender of our infantine weaknesses and the most graceful of our infirmities. If He deigns to seek His Mother's breast, we see in it the mystery of His asking food from His own creature, when He is Himself at that very moment feeding all the beasts of the field, and the birds of the air, and the fishes of the deep, and the populous tribes of men. In other words, every action and every suffering of the Sacred Infancy interests us, not so much for its own sake, as gentleness under suffering, sweetness under desertion, silence under wrong, and the like, interest us in the Passion; but it interests as a new way of realizing the Incarnation, as a fresh usage of the Incarnation, as if we could hardly have our fill of gazing upon that most wonderful mystery, and went round it and round it to look at it in every conceivable light and from every possible point of view, and multiplied our ways of expressing it, and always found it equally new and equally delightful. The devotion to the Sacred Infancy is the devotion of one thought, of one idea, of one mystery, while the devotion of the Passion embraces the practices of all virtues, the varieties of character and spirit, and a thousand other considerations, with the remembrance of the Incarnation lying at the bottom of them all, sustaining them and making them what they are. The devotion to the Blessed Sacrament resembles that to the Sacred Infancy. It has the same character of unity, the same varying and diversifying of a single idea, a single mystery; and moreover the idea and the mystery in the one are the same as in the other, namely, the Incarnation, not in its results, not in its blessings, not in its magnificent developments, but in its simple, beautiful self. Love delights to multiply the object of its affections. It varies the thought of it in every possible way, and clothes it in every conceivable form. It seems as if it thus gained fresh fuel for its fire, as if new excellences were revealed in the beloved object, and as if its own fervour and fidelity were manifested more feelingly and more loyally. So is it with us and our Incarnate Lord. We may live a long life, and through all that life by His grace may serve Him faithfully, and have no other love but Him. Yet never do we seem to have fathomed that one depth of His love, the gracious Mystery of the Incarnation. We study it with the keenest powers we have, we meditate upon it with anxious diligence and devout application, we repose upon it in the tranquility of prayer, we salute it with swift and fiery ejaculations. And still it is ever new. Still each day we return upon it again and again with the same blissful fascination. That one thought is enough for us. As children turn and turn their kaleidoscope, and yet never come to the end of its brilliant combinations, so is it with the Incarnation and ourselves. It is one thing to us in Jesus sleeping, another thing Jesus weeping, and again another in Jesus at the breast. This is the peculiarity of the devotion to the Sacred Infancy. It is the turning of the kaleidoscope; the brilliants are ever the same, yet the changes are infinite even when they are like, the beauty endless, the sweetness beyond words. I am speaking of the devotion to the Sacred Infancy as it exists among the great multitude of the faithful, and as it is handed down to us in spiritual works. There are two classes of persons to whom this devotion seems wider and more various; but we shall not find on examination that its character is really changed in either of the two classes. Persons who unite with the practice of mental prayer accurate and minute theological studies, find a greater separateness and distinctness in the different mysteries of the Sacred Infancy, from having continually present to their minds the Catholic teaching that our Lord's Soul was exempt from all imperfection of ignorance, and that He had of course the full use of reason from the very first moment of His Incarnation. Thus our Lord is not simply helpless and passive, allowing His inanimate creatures, heat and cold, wind and wet, night and day, to work their will upon Him, permitting the unreasoning animals to draw nigh to His infant Body and warm it with their breath, and suffering with a mere unresisting patience the passions and affections, the wants and weaknesses, the pains and incommodities, incidental to human childhood. Everything is as much intended, is accompanied by as much mental process, and directed by as much actual energy of will, as the mysteries of His Three Year's Ministry. Thus, as each action of His Blessed Passion had many intentions consciously referred to several ends, and comprised several fitnesses, far more than we can ever compass or exhaust, in like manner each mystery of the Sacred Infancy was characterized by the same variety, seeing that while He was a child in stature He was full-grown man in the use and empire of His consciousness and understanding. True as all this is, there is nevertheless more fancy than reality in the change which it makes in the character of the devotion. Our Lord, both as a child and as adult, vouchsafes to perform human actions, and the proper actions of Infancy and Manhood according to the season. The character of the actions is determined by their own nature, circumstances, and moral significance, and not by the amount of consciousness or intention which actuates them; for every one of our Lord's actions was of infinite value, the least as well as the greatest, and merited immensely. His grace was incapable of growth or of degrees, and therefore the supernatural character of His human actions was equal in all of them: and ordinarily speaking, devotion to the mysteries of our Blessed Lord is devotion to those external manifestations which He was pleased to make of His Human Nature and of the grace with which it was anointed. Thus it remains true that while our Lord uttered every infantine cry with as much clear use of reason as when He uttered His awful cry of dereliction on the Cross, He was still as an infant really helpless, suffering, weak and infirm, and that He condescends to exhibit to us as truly, and to endure for us as really, the peculiar ignominies and abasements of childhood, as He does the quite different ignominies and abasements of maturer life. The character of the devotion is only apparently changed by the memory of the theological doctrine; it is not really so; and while we should be far from denying the great assistance which prayer often derives from scholastic theology, it must be remembered that the processes in prayer are lofty in proportion to their simplicity. Hence it may be questioned whether we do not sometimes lose tenderness of love and intimacy of union with our dearest Lord by thus refining on the devotions to the Sacred Humanity. According to God's ordinary method, prayer must be affective before it is contemplative, and discursive before it is affective. Yet it will be a serious hindrance to our progress if we value it in proportion as it is discursive, instead of seeking to simplify our reasonings as much as possible, and to get out of them and beyond them as quickly as we can. We should thus be cherishing an imperfection, and canonizing it as if it were something to be retained and cherished. The consequence would be that our prayer would at best become unprofitable and dry, and would rather bring with it the science that inflates us, than the humble sense of our own wretchedness, and the self-revengeful appetite of mortification, without which prayer is nothing worth. For the crown of prayer is the worship of God through the subjection of our passions. The other class of persons who might be disposed to quarrel with any description of devotion to the Sacred Infancy as being a devotion of one idea, and by this very characteristic distinguished from devotion to the Passion, are those whose attraction leads them to dwell rather on the interior disposition of Jesus than on the details and circumstances of His outward actions. Beautiful as this spirit is, to which so many saints have set their seal, it does not seem to interfere with the character of the devotion in question. For, as in the former case, the full use of reason only causes our Lord's infantine actions to differ from ours, and does not in any way destroy the reality of their helplessness and weakness, so in this case the existence of certain interior dispositions stands upon the same footing as the use of reason, distinguishing our Lord's actions from those of common men, but leaving untouched the distinction between His actions as Infant and as Adult. Persons devoted to the interior dispositions of Jesus may sometimes imagine that the glory of His Father, or the spirit of oblation, or charity to men, or the love of His Mother, or the spirit of penance and abandonment, may predominate respectively in different mysteries of the Infancy; His sleep may thus be distinguished from His tears; His cries from His smiles, and His hunger from His voluntary concealment of the possession of reason. Yet the value of these pious reflections depends more upon the dispositions of the soul that gives birth to them than upon anything else, unless some private revelation or some infused science give a higher character to them. I do not mean to say that they are not most valuable, and far more precious even than the delicate refinements of theology, or that they do not give a very much more Divine character to our devotion to the Sacred Infancy. In fact that devotion is but imperfect when separated either from the fulness and minuteness of some doctrine, or from the consideration of our Lord's interior dispositions. All I mean is, that, while the one gives greater truth and the other greater depth to this most beautiful and efficacious devotion, neither the one nor the other changes its character, or gives it the same sort of variety as devotion to the Passion, or hinders its being a devotion of one idea, which love, knowledge, and spiritual discernment represent to us a thousand-fold. Neither our knowledge of theology nor our familiarity with the interior dispositions of our Lord will make our devotion to the Infancy the same as our devotion to the Passion, nor make ours a really different devotion from that of the multitude of the faithful; although if we are on our guard against fancifulness and sublety, both our scholastic doctrine and our interior spirit will immensely heighten our devotion. Still it is not a question of kind, but of degree. But the connection between the devotion to the Blessed Sacrament, and to the Sacred Infancy, does not result only from their both being devotions of one idea; but also from the fact that the one idea is the same in both of them, namely, the Incarnation. For the great mercy designed in the Blessed Sacrament is the renewal, and not the renewal only, but the extension also, of the Incarnation. The presence of the Eternal Word made Man, residing in His own creation, and sharing and participating in it, was the greatest gift which God could confer upon the world; because the Hypostatic Union was the closest intimacy which was possible between ourselves and Him. The sun shone upon the Incarnate Word, the moon lighted up the mountain steeps where He was at prayer, the wind stirred His hair, and the ground was pressed by His feet. Silence listened to His Works as if it were enchanted, and they fell upon the thirsty hearts of men like dews of grace. When the day was done, and sleep stole gracefully over tired nature, it ventured to lay its hand upon the heavy eyelids of the Incarnate Word, and He slept. The elements obeyed Him, or He obeyed them, as He willed. He was a sight, a sound, a touch, a fragrance in the world, such as never had been before, and which was worth infinite creations, nay, far transcended all possible creations whatsoever. If the eye of the Eternal Father had looked with merciful complacency over the virgin world, when it came fresh from His creative hand, and had deigned to pronounce it beautiful and good and blessed, how beautiful and good and blessed must it have been then, when He who was co-equal and co-eternal with Himself was therein, having assumed a created nature, so that human actions of infinite price and of unspeakable loveliness and of divinest grace were issuing from Him at all hours. From the very moment of the Incarnation, creation became quite a different thing from what it ever was before, simply from the presence of our Lord in the flesh. Now God's gifts are "without repentance." It is not His way, blessed be His holy Name! to withdraw what He has once given. There is nothing retrograde in the course of the Divine compassions. One mercy is superseded by a greater; it does not retire, and give place to a less. Such is the royal munificence and exuberance of heavenly love. Hence to withdraw from the earth the presence of the Incarnate Word, once conferred upon it, would be indeed to leave the children of men orphans; our Lord Himself implies this, when reading the anxious thoughts of their hearts, He said to His disciples, I will not leave you orphans; I will come to you. Either then our Lord's visible presence upon earth was to be continued, or its place was to be supplied by a presence, every way as real and substantial, and of a higher, more befitting, and more spiritual character. Indeed human life as God has ordained it in the world would have become impossible, if the visible presence of Jesus had continued, when His resurrection had been proclaimed, His faith taught, and His Church established. It must have given rise to an entirely new state of things, and to laws of life, of moral life, as different from the present, as life in Jupiter or Saturn would be in physical respects. The doom of the world would have been hastened and precipitated. The presence of Jesus, conversant with men, would have been a touchstone which would have driven all mankind very speedily either into the reprobation of the Jews, or into the grace of the Apostles. All wickedness would have put on the awful characteristics of the wickedness during the Passion; and all the probations of life would have centered in the one trial of respecting or accepting the visible mission of Christ. Besides the whole population of the world would have been thrown in vehement and irresistible pilgrimage upon one region and such social and political consequences would have ensued as would have utterly destroyed the equilibrium of the world. Under the present dispensation of things earth is not capable of enduring a transformation into a sensible heaven. Moreover, it was necessary for our Lord's own friends that His visible Presence should have performed its transient mission, and be discontinued, and the heavens contain Him until the consummation of all things. It is expedient for you that I go away, were His own words to the Apostles. For, as several of the ancient fathers as well as the modern doctors of the mystical life teach, they had become attached to His visible presence with an attachment which not only impeded their own progress in spirituality, but was not so honourable to Him as the profound adoration mingled with sweet familiar love, which His absence and the descent of the Holy Ghost would pour into their souls. Thus, it was not only expedient for them that He should go away, because for them and for us, all things considered, the descent of the Holy Ghost was a more fitting and so more excellent thing than the continuance of His visible presence, but also because its place would be supplied by another presence of His own dear Self, more wonderful and more excellent and more spiritual than His visible presence had been. So much was there in those few words. A little while, and you shall not see Me; and again a little while, and you shall see Me, because I go to the Father! It was necessary then, it was in the usual course of Divine gifts, that His new presence should exceed His former one; and this is His Presence in the Blessed Sacrament. It was not precisely our Lord beautiful, or our Lord gentle, or patient, or consoling, or holy, or powerful, that earth could not do without and wanted back again. It was not precisely the Babe of Bethlehem, or the Boy of Nazareth, or the Man of Calvary, without whom heavenly love seemed as if it must faint and die away upon the earth, when the mystery of the Ascension left it all widowed, leaning its whole weight on the prayers and presence of His Immaculate Mother, the queen of the Apostles. It was the Word Incarnate, it was Jesus Himself simply, it was the Human Flesh and Blood which He had taken to Himself and which men had touched and handled, and had been straightway healed and forgiven: this it was which we wanted, Him as Incarnate, Him one of whose natures made Him our Brother, and Him with that nature whereby He was our Brother; and thus it is that we receive Him in the Blessed Sacrament. It is His Incarnation which is our stay, our blessing, our love, our consolation, in His new sacramental residence amongst us; and as in each Mass He is ever renewing and reproducing His Incarnation, it comes to us, as in the mysteries of the Sacred Infancy, day after day, with all the novelty and freshness of His first coming. Thus the ritual of the Church, and the apparitions which God vouchsafes to the Saints, and the actual phenomena of the interior life, establish for us beyond a doubt the striking fact that there is a real and peculiar connection between the devotion to the Blessed Sacrament and the devotion to the Sacred Infancy. And when we venture to search for reasons, we seem to find them first in the fact that the various mysteries of the Blessed Sacrament are copies or repetitions, with some additional Divine touches, of the mysteries of the Sacred Infancy; secondly, in the fact that both the devotions are devotions of one idea, variously represented, and as such are distinct on the one hand from such devotions as those to the Passion, or the Three Years' Ministry, and on the other from devotions to single mysteries, like the Scourging or the Crowning, or to compendiums of the Incarnation, like the Precious Blood of the Sacred Heart; and thirdly in the fact that the single idea of the two devotions is the same, namely, the Incarnation. We must now descend to the details of the Sacred Infancy, and draw out minutely the parallel between it and the Blessed Sacrament.